HiakaSat (Hyperspectral Imaging, Aeronautical Kinematic Analysis Satellite), also referred to as HawaiiSat-1, is a small satellite mission developed and operated by students of Hawaii University. The satellite is the primary payload of the inaugural launch of the SPARK / Super Strypi rocket, completing the ORS-4 mission in 2015. Originally, the HawaiiSat-1 project was designed to be an 80-Kilogram satellite when work started in 2010. The satellite design passed its Critical Design Review in 2011, but requirements from the Operationally Responsive Space Office dictated the mass of the satellite to be reduced to 40kg. 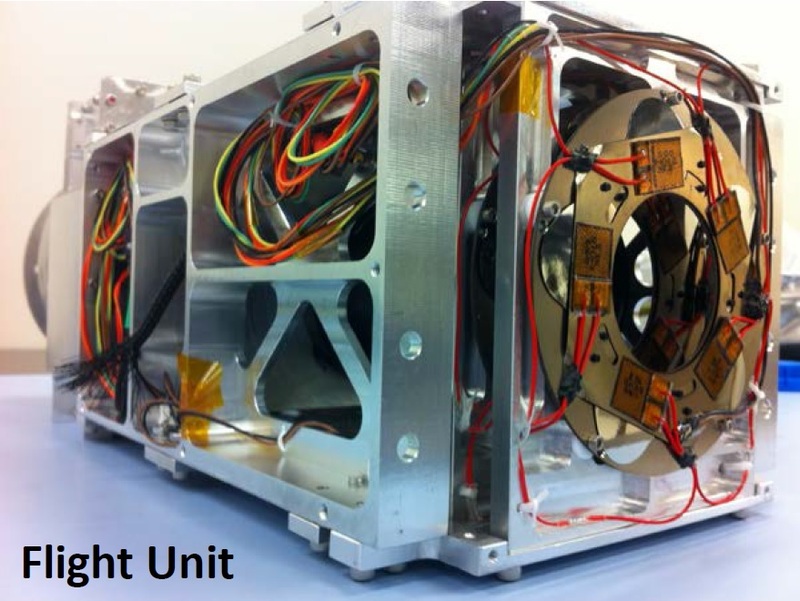 Therefore, two main payloads – the Thermal Hyperspectral Imager and C-band Radar Transponder Experiment – were cut. 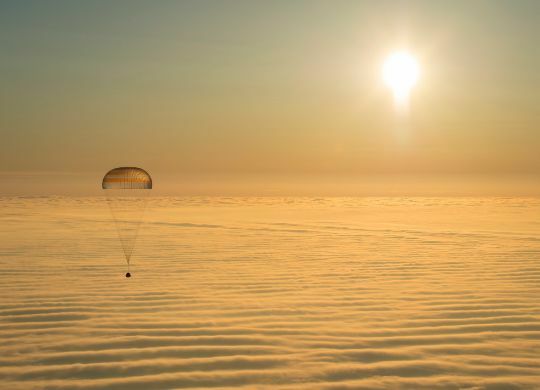 Later, the mass was again increased to 55kg including 7.3 Kilograms for the satellite payload. HiakaSat aims to demonstrate the satellite bus as a cost-effective on-orbit platform for technology demonstrations, to conduct remote sensing with the Space Ultra-Compact Hyper-Spectral Imager, to demonstrate two color cameras, to provide workforce development opportunities for students and recent graduates, and to make further developments of the ground infrastructure needed for the integration, testing and operation of satellites. 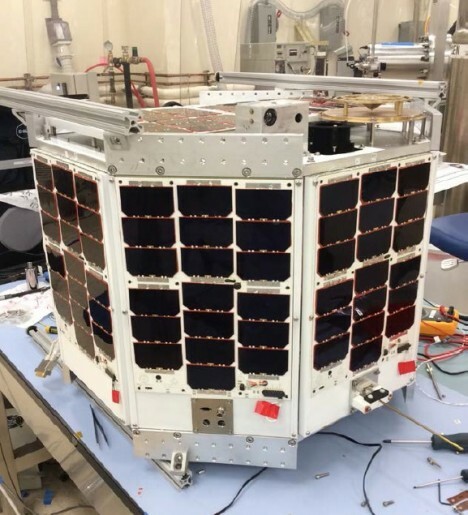 The satellite finished assembly and testing in 2013, but had to wait over two years for its launch due to delays on the SPARK launch vehicle side. The HiakaSat spacecraft is based on an octagonal cylinder that incorporates a number of internal decks supported by struts. 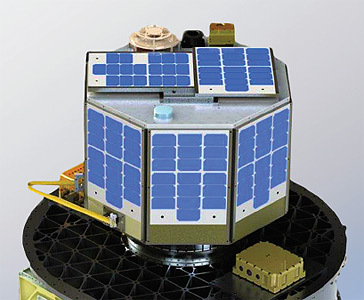 The satellite’s structure measures 64.7 centimeters in diameter and 40.3 meters in height. The octagonal shape was chosen to maximize the power that can be generated by the body-mounted solar panels. The honeycomb construction of the solar panels serve as the side panels of the satellite and attach directly to the vertical and horizontal structural members. 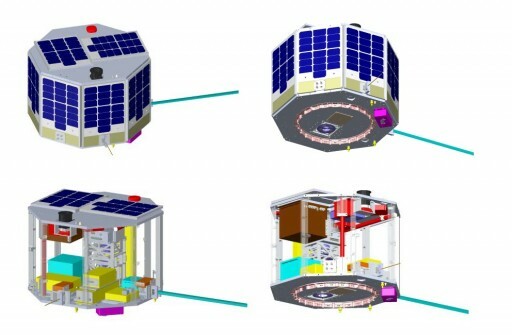 The structural system predominantly uses Aluminum and constructs a standard satellite platform suitable for a number of payloads. There are ten body-mounted solar panels installed on the side panels and the zenith face of the satellite, each consisting of two modules with 19 individual cells per module. HiakaSat makes use of Triple Junction Gallium Arsenide solar cells with monolithic diodes, achieving an energy efficiency around 28%. Peak power generation by the solar panels is 42 Watts with a nominal in-orbit average of 37 Watts, leaving an 11-Watt power margin. Electrical power is stored in Panasonic Lithium-Ion battery cells, seven mounted in series as part of four parallel strings, generating a total capacity of 8.8 Amp-hours. The Electrical Power System delivers a 28-Volt unregulated bus to the batteries. From there, two power buses are conditioned – a 12V bus that feeds the imaging payload and the Separation Imager and an unregulated 28V bus that delivers power to all the other spacecraft subsystems. The Electrical Power System is outfitted with its own processor that controls all power functions and runs Software Watch Dog Timers that require periodic re-sets from the telecommunications system and main flight computer. If these re-sets do not occur, i.e. in case of problems with one of the other subsystems, the Electrical Power system will make a hard re-set of the system to restore its functions. The EPS electronics themselves run on 3.3V power delivered by a redundant regulator within the EPS. The Attitude Determination and Control System is comprised of a series of sensors for precise attitude determination – three 60° FOV sun sensors, two inertial measurement units and two three-axis magnetometers achieve an attitude determination accuracy of 1°. The attitude actuators include three magnetic torque rods and a reaction wheel assembly to maintain an Earth-pointed attitude with a pointing accuracy of the +z vector of the spacecraft on the order of 3°. HiakaSat is equipped with two general purpose computers, one in charge of all spacecraft functions, the other in control of the attitude determination and control system. The computers are 400MHz machines running on a PC-104+ backplane, a design flown to space aboard satellites and tested on the International Space Station. The onboard computer handles all data of the satellite payload, systems telemetry and handles commands linked up from the ground to command all satellite systems based on power budgets and set duty cycles. The telecommunications subsystem is comprised of S-Band and UHF-Transceivers for use in command uplink and data downlink to the mission’s main ground station at Kaua’i Community College that operates alongside a global network of ground stations. A UHF beacon transmits satellite status telemetry on the amateur frequencies to be available to all radio operators. The comm system features its own power regulators to deliver a 5V bus to its electronics. HiakaSat has an onboard data storage capability of 3GB to hold imagery acquired by the payloads for downlink by the S-Band system. The Thermal Control System of the satellite relies primarily on passive components such as Multilayer Insulation blankets and paints. An analog-to-digital board can accept 32 single-ended inputs from Resistive Thermal Sensors to deliver a wealth of thermal information from all satellite areas to the onboard computer. Heaters can be used to maintain critical satellite components at their survival temperature. The primary payload of the HiakaSat spacecraft is SUCHI – the Space Ultra-compact Hyperspectral Imager, developed at the Hawai’i Institute of Geophysics and Planetology. It is based on a variable-gap Fabry-Perot interferometer implemented as a Fourier Transform Infrared Spectrometer testing a new form of ultracompact hyperspectral sensing technology. The instrument is about 40 by 10 by 12.5 centimeters in size with a low mass of conform to the volume, mass, power and data requirements of small satellite missions. Its camera system and vacuum sensitive electronics are housed in a pressurized container. 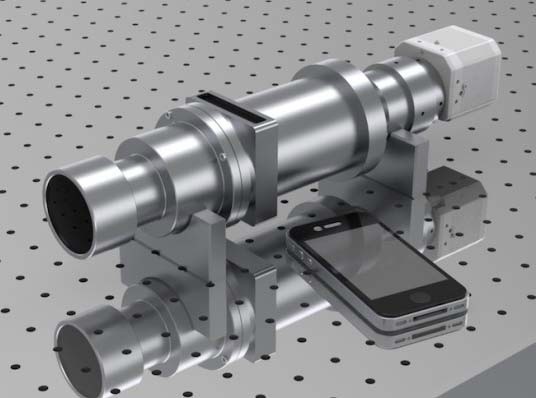 The multi-element refractive optical system, with a germanium interferometer between the objective and relay lenses, focuses the incoming radiation onto a Microbolometer Array Detector. The Bolometer Array Instrument is an uncooled infrared imager that does not rely on a cryocooler to keep the detector cooled. The array consists of 320 by 256 pixels. Each pixel on the array consists of several layers including an infrared absorbing material and a reflector underneath it that directs IR radiation that passes through the absorber back to the absorbing layer to ensure a near complete absorption. As IR radiation strikes the detector, the absorbing material is heated and changes its electrical resistance which can be measured via electrodes connected to each microbolometer and processed into an intensity read-out. The SUCHI instrument collects spectral data across a wavelength range of 7 to 14 micrometers relevant for geological sciences such as mapping of different minerals, volcanic hazard assessments and a series of other remote sensing applications. The wavelength selection is accomplished by varying the gap between the two pieces of germanium which causes multiple reflection/transmission of light rays from the system. The rays emerging from the interferometer recombine with a phase shift that varies linearly across the optical axis, thus generating an interference pattern which can be recorded by the detector. The instrument collects 60 frames per second so that the forward motion of the satellite causes each ground scene to be imaged at a different position within the interferometer pattern. The frame sequences will be geo-registered so that an interferogram can be generated for each point on the ground for conversion to an energy spectrum through standard Fourier transformation. SUCHI achieves a ground resolution of 220 meters for seven wave channels. Instrument calibration is accomplished by two pairs of shutters – one pair located at the aperture of the instrument, the second between the relay optics and the detector. Of each pair, one shutter is heated while the other remains at the ambient temperature. The aperture shutters are used for instrument calibration from raw counts to spectral irradiance while the detector shutters are used to correct detector non-uniformity and drifts. HiakaSat is the first mission to demonstrate COSMOS – the Comprehensive Open-architecture Space Mission Operations System. This is a collection of software packages to assist in all areas of mission operations from development to data distribution and flight management.